FlipFlop Wines Review. Also know as Rachel is a cheap date. I love wine. I am a huge fan of a big, fat, chewy, Cabernet. 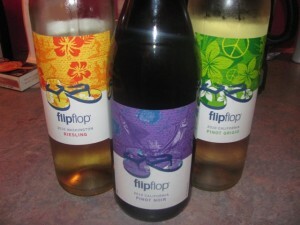 So when got the opportunity to review FlipFlop wines, I was all over it. David Georges is the vintner of FlipFlop wines. David attended the University of California at Davis first to study viticulture (grape growing), but then decided to also study enology (winemaking) as well. He was mentored under Dr. Andy Walker, the world’s foremost vine and rootstock expert and graduated with a dual B.S. in both Viticulture and Enology. Soon after graduating, David’s perspective as viticulture-trained winemaker was put to great use at Codorníu (now Artesa), Davis Bynum Winery and Raymond Merlo Estate Vineyards, where he honed his winemaking skills. For this review I received 3 bottles of FlipFlop wines to try. I received the Pinot Grigio, Riesling and Pinot Noir. First up, the Pinot Grigio. The Pinot Grigio is a light bodied wine with lots of fruit notes. There are subtle hints of citrus fruits in this wine. It pairs best with pasta or vegetable dishes. My take. I liked this wine. It is crisp and refreshing without being overly worked with the flavors. The Riesling. This is a lighter wine with a medium body. It has lots of fruit hints with peach, melon, and apricot. It has a sweet start with a smooth finish. My take. Much to my surprise, I loved this wine the best of the 3. Maybe it has a lot to do with the heat but it was so refreshing and light. The sweetness was perfect. It is the perfect light wine for those hot summer nights. The Pinot Noir. This is a medium bodied wine with a dry taste. It has black cherry and vanilla hints with the perfect amount of spice. It pairs well with seafood dishes and even chocolate chip cookies. My take. This was my husbands favorite of all the wines we tried. With my love of big red wines, I really thought that it would be mine also. I did enjoy it and it paired great with the chocolate we had. Every bottle of wine comes with a handy guide on the back that lets you know where it ranks from dry to sweet. This takes all the guess work out of choosing the perfect wine. FlipFlop wines has also partnered with Soles4Souls. For every bottle of wine sold, Soles4Souls will donate one pair of shoes to someone in need. For more information on this great organization, make sure you check out their website. Overall, I was really impressed with all of these wines. I love the fact that they have found a way to give back by partnering with Soles4Souls. And each bottle retails for around $7, proving that good taste does not have to cost a fortune. With a variety sure to please every taste, FlipFlop wines lives up to their philosophy of ‘to each his own’. You can learn more about FlipFlop Wines or even shop online by visiting their website. And be sure to stay up to date on all things concerning FlipFlop Wines by liking them on Facebook.